Once in a while, a new investment opportunity comes along that cannot be ignored. These days all of the buzz seems to be about peer to peer lending. After reading about the ROI reported by investors, I just had to look into this more and share my findings here at Modest Money. Keep reading to find out what I uncovered about the best performing peer to peer lending company Prosper. While the interest rates others are achieving are impressive, it’s not suitable for everyone. The following review was written for peer to peer investors. If you are interested in borrowing money via peer to peer lending, I highly recommend you check out this Prosper review. Pros – My favorite part of Prosper is the way interest rates are set and agreed upon. Instead of saying “you have this credit history, you get this interest”, Prosper works on a bidding system. Borrowers list the amount of interest they’re willing to pay while investors list the bottom line interest they will accept. The deal is made when the borrower and the lender agree on a rate. This is one of the reasons I say Prosper offers real “social lending”. This unique lending system ensures that all parties are happy. By cutting out the corporate banks, or the middle man, investors can get a greater return and borrowers can get better rates at the same time. Cons – Prosper definitely isn’t for everyone because like everything in this world, it has a negative side. The truth is, you have to have an Experian score of 640 or higher. But, that is to ensure that the lending peers don’t take too much of a risk. Prosper had much more cons, as all peer to peer lending did before 2008. In 2008, the SEC stepped in and considered peer to peer lending to be a form of securities and such companies that sold securities would have to be licensed. On 2 companies did and, the world of peer to peer lending became far less risky for both the lender and the borrower. Because Prosper provides services on a peer to peer basis, investors and borrowers are going to be looking at this option from completely opposite points of view. That being said, I’m going to have to give two parts to each section of this review. Being that this is my first time doing this, I’d love your feedback on how it came out! Borrower Default – One big risk in any peer to peer lending program is borrower default. The bottom line is, if your borrower defaults on your loan, you are out of luck. Being that Prosper deals in unsecured loans, there is no collateral that you can rightfully call yours if a borrower defaults and never pays your loan back. I suppose that at some point you could take legal action but, that could take years and quite a bit of money so, the loan would need to be substantial for this type of action. Prosper Default – Another risk is that Prosper could go out of business, right? Well, yes, I suppose any business could eventually go belly up. But, in this case, I just don’t see that happening. They have been granted investments from the same investors that invested in people like Google’s Larry Page and Apples Steve Jobs. Sequoia Capital is known for doing their research and making the right investments and, they seem to be behind Prosper! As with investing, any borrowing will always come with risks, risks of bad terms and poor lending practices are all at the forefront of minds of borrowers who are working with an unknown lender. The good news is, due to the SEC changes back in 2008, there really aren’t any risks here. Everything is held to strict full disclosure laws and, it’s up to you to choose the loans you agree to. It works just like any other loan, the higher your credit score, the lower your interest rate and vice versa. Once your loan application is approved, you are required to make monthly payments from which some is allocated to interest, some is allocated to principle balance and so on. There are late payment fees if you are late which are $15 but, that’s even lower than your average bank fee. The bottom line is, the risks are pretty small for customers that qualify! Ability To Choose Your Risk And Reward – As an investor, you know that the higher your risk, the higher your reward and the lower your risk, the lower your reward. Prosper gives you the ability to choose the loans at the risk and reward levels that make you comfortable with lending. Great Tools For Diversification – Knowing that some loans will have higher rewards and some lower, it’s best to diversify your investment portfolio. This is the same across all channels of investment from stock exchange to foreign exchange to peer to peer exchange. The basic principals are all the same. Prosper offers some of the most complex tools on the market to help you get a full understanding of your risks! Lower Interest Rates – Because the lending is peer to peer, there are no stockholders that the lenders have to report profit to. All the profit with the exception of a 1% fee for using Prosper all goes into the lender’s pocket. So, without the worry of enormous profits to please stockholders, it’s possible to get pretty low interest rate loans here. Low Fees – Most of the time, when borrowing from lenders, you are hit with tons of different fees. There’s account maintenance fees, interest rates, annual fees and more. The list can go on and on with some loans. This isn’t the case with prosper. You pay your interest rate and, there’s a $15 late fee if you’re late on a payment. No real Fuss. Is There Any Credit Score Like System? Now, this is a question that’s important for both borrowers and investors. Borrowers want to know to see if they qualify, if so, what rates they qualify for, and more. For investors, you want to make sure that if you’re investing your money, you’re going to get it back, with interest! Therefore, it’s important to gauge and understand the risk involved in any investment. AA – Excellent. Although there are no guarantees in the world of investing, investing in someone who’s got a AA prosper score is going to ensure the least risk in your investment. However, as with any market, lower risk, means lower profits. On the borrower side, those with AA will love the low rates they receive! A – A is a very good score. Although, there is some room for improvement, there’s not much! This borrower has things going for them and is a pretty sure bet for investors. Therefore, they also enjoy pretty low rates. B – Having a B rating is still good. Not great, but worth having. Although investors know they take some risk lending to borrowers with a B rating, they know that the risk is minimal. However, as far as the borrower is concerned, as the rating goes down, the interest rate starts to go up. Although they’re still not too high at this point, the increase does become noticeable. C – A C rating is like the step between Good and Fair credit on a FICO scoring system. Although the score is still a bit above the fair credit benchmark, investors start to take a larger risk at this point. Although most people do pay their loans back when borrowing through Prosper, this is where an investor must start really taking risk into account. D – A D rating is still in the fair credit range. It shows that the borrower is making attempts to improve their financial stability, or that they’ve recently ran into a financial hiccup. None the less, as we move further and further down the chain, risk for the investor goes up as do interest rates for the borrower. E – An E rating is the low, fair margin keep in mind that you need an Experian score of 640 or above just to qualify. So, people with an E rating probably range somewhere between 650 and 680. These are going to be some of the highest risk borrowers, and because of that, they will the highest interest rates for their loans. HR – Finally, we have the highest risk category, the HR rating. HR is the highest level of risk that an investor will take on. The borrower most likely has a credit rating between 640 and 650, making the investment pretty risky. What If The Investor Needs To Cash Out NOW? This can be a pretty scary concept when it comes to peer to peer lending. As the borrower, you may feel forced to come up with the money fast. As an investor, you may not be able to liquidate your investments fast enough to handle emergencies that may arise in the future. Well, this is where Prosper really stands tall! Prosper not only offers a first hand peer to peer market, they also offer a second hand investor to investor market for the sale of funded loans. Therefore, if the lender needs their money before the loan matures fully, borrowers don’t have to worry about being harassed to pay the loan off in full to quickly. For borrowers, they have the security in knowing that their funded loans are liquid assets. Invest in Prosper with no problems! Unfortunately, you can not invest with Prosper in any other states. Although there are lower risk investments out there, this is a pretty good one in my eyes. With the ability to set the level of risk you are comfortable with taking and the tools to diversify your investment portfolio, I can’t see why you wouldn’t want to give it a shot. But, remember, every financial option is unique and designed for a specific group of individuals. That being said, always start out with only a few bucks and see if it’s a platform that you can stand behind with bigger investments. If I were in need of a loan and had the credit score to take part in Prosper peer to peer lending, I would definitely do it! Why not? The interest rates are pretty low, the fees are at a minimum and, the money gets to you pretty fast without the need to jump through rings of fire while whistling daisy and juggling bowling balls! Prosper is a good company that has a lot of backing, one that I’m actually considering working with personally after a conversation with my securities advisor. I truly think that getting a Prosper loan would be a great experience. If you’re really going to pursue peer to peer lending, then do not limit yourself to Prosper. Also check out other p2p lending websites such as Lending Club. This will be helpful in weighing your options. Also, check out Prosper as a borrower if you need a personal loan yourself. 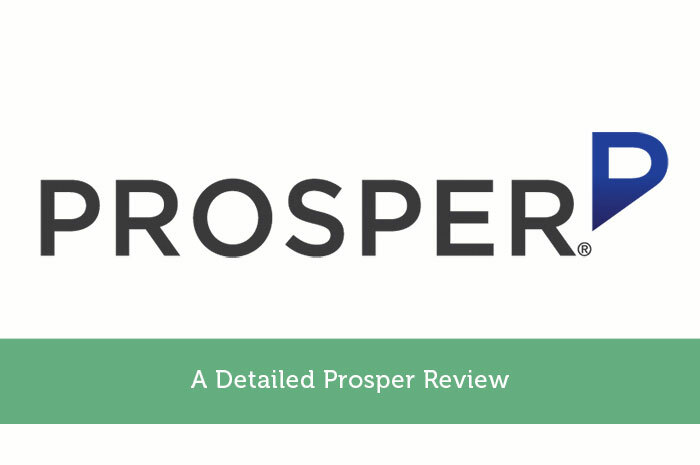 Read our Prosper Review to learn more about peer to peer lending. I really like the idea of prosper and it’s really no different that the seller financing that allowed me to purchase my practice years ago. I like that you can invest small amounts for many different borrowers so that if someone defaults, you aren’t losing everything. That’s the beauty of Prosper I think, you can spread your risk somewhat and end up with a good return at the end. With a bit of research and planning you can create a loan portfolio that not only fits your risk profile but gives you good returns. This sounds like it could be a possibility for the future, with benefits for both the lender and the lendee. Hey Terry, thanks for swinging by. Prosper is definitely a good option for both sides. Glad to hear you might start it in the future. I’ve done quite a bit of research on P2P lending in the past 6 months. It seems like a great way to diversify your investments and it’s more active than investing in mutual funds. If you’re like me, you like constantly doing something but I know that isn’t normally good to be active with investments. P2P lending is an investment where it helps to be active. I’m sure I’ll invest in either Prosper or Lending Club in the next year just to check it out. Indeed, with P2P you have to be somewhat really hands-on and aggressive in your research & evaluation if you are going to have a great return on your investment. I’ve used lending club which is prospers competitor essentially and I love it as an investor. It is pretty hands on, but it has great returns with pretty low risk. Sounds great, I’ll have to check it out. Very detailed review – good job. Hey Derek, thanks for swinging by. Glad you enjoyed my review. Do you have a Lending Club account too? I’m curious which one people prefer. I definitely want to start a minimum balance account in a P2P account in the next few months. Hey Tara, I recently did a comparison of the two. They are both pretty similar and honestly it boils down to who you want to work with. I am a fan of the idea as an investor. As a borrower with P2P, does the system allow you to repay loans early if you wish? Absolutely…you can repay your loan earlier with no fees on the transaction! I think the way it is designed is to really help people out without putting extra burdens on them. i will keep this company in mind!! thank you! Awesome, thanks for swinging by Alicia. With my experience with Prosper and LendingClub what I like more about Prosper is that if you qualify for a loan and want to receive $15k, you can. With LendingClub, in my experience, if you request say $15k, you may only be approved to borrow say $4k…so I’m a fan of Prosper myself. Can foreigners join this company? I’m not from the States and just read this article and would like to join if possible. There are other companies that offer p2p in other countries. Prosper and Lending Club are currently US only. With p2p lending you’re setting up the Bank of Frank. It’s not insured and just like a regular bank you’re taking on the risks of your borrowers. The statistics provided, mostly since 2009, reflect an improving economy, results will be less favorable in a recession. That said I still think it’s a great idea who’s time has come and I will be investing. I’ve heard about Prosper but never tried it. After reading your review, I think it’s worth a try, at least for a small investment. Thanks. Joshua, Great review of Prosper. The market for peer lending is really taking off and could kick it into overdrive next year. The Lending Club IPO will bring a lot of attention to the space and hopefully investors and borrowers with it. I interviewed Prosper President Ron Suber this week about the future of marketplace lending. He was optimistic but completely truthful about the hurdles. As the industry goes mainstream, I’m sure they’ll be plenty of stories in the media of people taking advantage of the system but these will be the exceptions. I absolutely love Prosper, I think its a great way to get around 10% return on your investments especially since you receive monthly principal and interest payments that if reinvested can create quite the snowball effect. Honestly, this has not been a good expereince for me. I accepted the loan only after speaking with their CSR who assured me I could pay off early without a penalty. He neglected to mention that anything I paid was subject to interest rates. Even though I paid an extra payment of $319.77 only $240 was applied to my principal. You may pay the loan off early but you will pay the full interest amount. I have little doubt that Prosper is an honest business. Despite that, potential lenders must be aware of some caveats that I wish I’d known about. The website remains clunky and transactions are updated at a snail’s pace. Customer service is readily available, but not well informed. The loan performance CS reps provided for my loan portfolio was FAR higher than it turned out to be. The numbers they use are the rosy figures (progressively 12%, then 11%, then 10%) assuming the very best case on repayment and defaults. Saying the CS reps are “not well informed” gives ample benefit of the doubt, as the nonsense they spew borders on dishonest salesmanship. As a spreadsheet geek I projected my own returns figuring in rates of default that were actually happening in real time. Early on it was apparent that the real return rate after defaults would be between 0.2% and 1.1%, taxable. That is based on over 450 loans in primarily in the B-C ratings categories. A handful of defaults, bankruptcies, and loans write-offs can quickly decimate any hope of a reasonable return on investment. Prosper may be useful as a social experiment and as a profitable venture for prosper, investors looking for a reasonable rate of return should run in the opposite direction. Clearly this article was written by the PROSPER people … along with most of the people that replied. I found PROSPER to misrepresent the loan process also misrepresent that they wouldn’t pull a hard credit inquiry until I approved the loan. Trying to get them to reverse the inquiry was like trying to get a kid to eat Brussels Sprouts. These guys are dishonest and I’m glad I didn’t do business with them.